Make sure you don’t miss out on learning the art of making your own semi-soft and feta type handmade cheese using traditional methods. This hands-on workshop is hosted by Sarah & Chris Styles-Power from The Shebbear Cheese Co in Devon. Sarah will be guiding you through the cheesemaking process, you will learn the use of cultures, rennets, draining, molding, salting and aging your cheese using everyday kitchen equipment. At the end of the day you get to take the cheeses you have made home with you and most importantly be equipped with the knowledge and skill to recreate these cheeses at home. All the equipment, ingredients and worksheets are provided. Clavelshay Barn will also be serving a scrumptious lunch, including some of Sarah & Chris’s handmade cheeses. Drinks will be provided throughout the day. An introduction to making sausages and salami at home. Inspiring you to take ingredients and invent your own additive and preservative free in your kitchen. This hands-on workshop is hosted by Donna Lucking from Ellises Farm in Devon. Starting with choosing the right pork and pig for that matter. Donna will talk about her experiences keeping free range rare breed pigs and butchering the cuts for sausages. Demonstrate the process of sausage production and the art of stringing the sausages together. There will be an opportunity to get hands on and have a go making sausages to take home. When you have mastered the skills of sausage making we will go on to advanced principles of curing dried salamis and chorizo and sample some Ellises farm cured meats. At the end of the day you get to take the sausages you have made home with you and most importantly be equipped with the knowledge and skill to recreate these sausages at home. Clavelshay Barn will be serving a delicious lunch with Donna's own salami and cured meats. Drinks will be provided throughout the day. Join us for a day of fun on Saturday 25th October 2014. You will be learning the art of making your own blue handmade cheese using traditional methods. This hands-on workshop is hosted by Sarah & Chris Styles-Power from The Shebbear Cheese Co in Devon. Sarah & Chris will first guide you through the cheesemaking process, you will learn the use of cultures, rennets, draining, molding, salting and aging your cheese using everyday kitchen equipment. Then they will teach you how to make two blue cheeses – your own Borough Blue and a Cambozola (blue brie) type. You will learn two different methods of adding the blue mould and you will then take the cheeses home to mature. Full instructions will be given on how to care for them. Clavelshay Barn will also be serving a scrumptious lunch, including some of Sarah & Chris’s handmade cheeses and local seasonal ingredients from the Somerset Region. For those of you looking to learn more about the art of sausage making, our brilliant local butcher, Stuart, will be hosting this mini workshop on Tuesday 17th March. You will learn how to select the right meat for sausage making. Stuart will then teach you all the techniques for mixing and stuffing your own sausages, how to use the equipment and come up with your own uniquely flavoured sausage recipes. Clavelshay Barn will also be serving snacks and drinks throughout the night. This brilliant workshop with extremely talented local photographer Neil White is for anyone who has a keen interest in food photography. It may interest food bloggers, B&B owners and restaurant owners who would like to be able to create stronger images for their websites/printed literature themselves. Clavelshay Barn will also be serving a scrumptious lunch. There are certain things you can experience in life that change the way you view the world. An Autumn foraging walk led by friendly, local expert Greg Power is one of them. Ask any forager why they scour the wilderness for food and the answer will invariably have something to do with the pleasure of communing with nature. You will learn to confidently identify and sustainably harvest an amazing array of common wild edible and medicinal plants around Clavelshay Farm. This would include introduction, safety brief, foraging walk – identifying flora and fauna, then collecting food ready for lunch. There will be a lunch cooked over an open fire. Game meat or fish will be the order of the day. After lunch another walk and tree identification if time permits. Interested in finding out what bushcraft is all about? This 6 hour workshop will teach you the basics of surviving in the wild. Join local Bushcraft instructor Greg Power as he teaches you the core skills of fire, food, shelter and water. All learning is hands on and the days are packed with information. There is no skill level requirement for this course. Why not give the gift of good food or creativity to your nearest and dearest by treating them to a Christmas Gift Voucher for one of Clavelshay Barn’s Workshops? We offer gift vouchers which will allow the recipient to choose a workshop that best suits their schedule. Email query@clavelshaybarn.co.uk to find out more. Come along and be amazed at what you can learn and be able to cook & create – bring your own ideas or just come along and use our expertise, inspirational examples and materials to get you started on cooking & creating something you will be proud of. All of our Workshops are hands-on, allowing you to cook, taste and create with your own family and friends. STRUGGLING FOR CHRISTMAS GIFT IDEAS? Why not give the gift of Good Food or Arts & Crafts to your nearest and dearest by treating them to a gift voucher for one of Clavelshay Barn’s Workshops? We offer gift vouchers which will allow the recipient to choose a workshop that best suits their schedule. Email query@clavelshaybarn.co.uk or call 01278 662629 to find out more. Please keep visiting our Workshop page for full updates regarding the details of all the workshops and more new workshops happening in 2015. This brilliant workshop with extremely talented local photographer Neil White is for anyone who has a keen interest in food photography. It may interest food bloggers, B&B owners and restaurant owners who would like to be able to create stronger images for their websites/printed literature themselves. You will need to bring a digital SLR camera with a standard or zoom lens. A tripod is not essential but preferable. You will be learning the art of making your own blue handmade cheese using traditional methods. 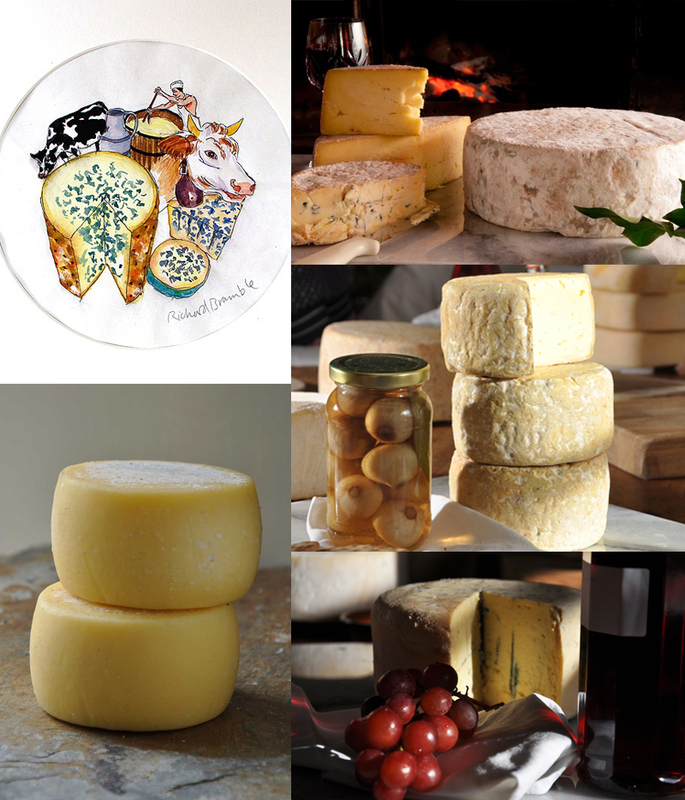 This hands-on workshop is hosted by Sarah & Chris Styles-Power from The Shebbear Cheese Co in Devon. Sarah & Chris will first guide you through the cheese making process, you will learn the use of cultures, rennets, draining, molding, salting and aging your cheese using everyday kitchen equipment. Why not give the gift of Good Food with your nearest and dearest by treating them to a gift voucher for one of Clavelshay Barn’s Workshops? We offer gift vouchers which will allow the recipient to choose a workshop that best suits their schedule. Call Sue on 01278 662629 to find out more. A couple of weeks ago, we hosted another fabulous Cheese Making Workshop with the very lovely Sarah & Chris from the Shebbear Cheese Co. It was our third workshop with the talented duo - the first workshop was held in November last year, and the 2nd workshop was in February this year, and was featured in The Western Morning News. As always, a fantastic time was had by all. Our next Cheese Making Workshop will be held next February 2014, and this time Sarah and Chris will be teaching us to make a delicious Cambozola type and Borough blue cheese. We can't wait! Details will be on our Workshop page soon. Today, Sarah and Chris have kindly allowed us to share their famous, absolutely delicious feta cheese recipe. There’s an enormous satisfaction in making your own feta cheese. Not only does homemade feta taste incredible, but it delivers a pioneer, up-by-my-bootstraps joy that a store-bought version just can’t give no matter how wonderful it is. Once you get your first taste of homemade feta, you’ll agree it was worth the effort. Stay calm! Cheese making is not supposed to be stressful. It may seem complicated, but it isn’t. Just go one step at a time and you’ll get there. Don’t get freaked out by the length of time it takes to make this. Much of the time is hands-off time. Another warning for those who haven’t made cheese or fermented something before; it gets a little, um, pungent smelling at times. Keep a-going. Don’t worry! Remember that cheese making is essentially controlling how fast and in what way milk ‘goes bad’. If it goes bad the right way it’s delicious! The only special equipment you really need to pull this off is a large stainless steel or other non-reactive pot, a heat source, a long knife or off-set spatula, a colander, something from to drain the cheese in and muslin cloth (extra, super, mega fine cheesecloth.) Do not confuse this with the “fine” cheesecloth you get in the grocery store or hardware store. It’s confusing terminology, but that stuff is so not fine. Just look for something called butter muslin and you’ll be fine. Cheese making relies on good bacteria (the kind found in yogurt) as a preservative. But there are other types of bacteria you need to watch out for, to avoid illness. Basic home sanitising measures can eliminate much of the danger. Clean counters with antibacterial wipes and wash your hands thoroughly before beginning (and throughout the process, as necessary). 1. Wash in hot, soapy water, rinse, and then submerge in boiling water for at least 10 minutes. 3. Use the sanitise setting on your dishwasher. Do not use bleach in cleaning the equipment, as this can interfere with the chemistry of cheese making. If at any point in the making or aging process you see small, uniform, round holes throughout the cheese, and it feels spongy, throw it out. To understand the science behind cheese making, it’s helpful to remember that it began as a way of preserving milk. You start by encouraging milk to curdle so that you can separate the solid portion (the curds) from the liquid (the whey). Rennet, a natural enzyme, is added to cause curdling. You also add live cultures, here in the form of yogurt—these “eat” the milk sugar (lactose) and produce an acid, which lowers the milk’s pH. That acidic environment, along with heat, helps the rennet curdle the milk. Once the milk coagulates into curds, you cut into it to let the whey flow out. The remaining whey is drained off by hanging the curd in cheesecloth for 24 hours at room temperature. Once drained, the cheese will have reformed into a solid mass, ready to be cut into cubes and then sprinkled with salt to draw out any remaining whey. 1. Heat milk in a large stainless steel or other non-reactive pot to 31C. Remove from heat. 2. Sprinkle culture and lipase over surface of milk and let stand for 5 minutes to rehydrate. Using skimmer and an up-and-down motion, gently draw culture down into milk without breaking the surface of the milk. 20 strokes. Cover and let ripen for 1 hour, maintaining temperature at 31C. 3. After 40 minutes of ripening time dissolve 1/4 rennet tablet in 17$ (50ml) boiled and cooled water. 4. After 1 hour add calcium chloride and draw milk down into milk using up-and-down motion. 20 strokes. 5. Add rennet in water and draw down into the milk as before. 6. Cover and let set for 30-40 minutes (this sometimes takes 1 hour). Maintaining temperature at 31C. 7. Check for a clean break. If achieved, use a palatte knife and cut into 3/4 (2cm) cubes. Let stand for 5 minutes. 8. Stir curds gently with skimmer for 20 minutes. They will firm up and shrink. Let stand for 10 minutes. 9. Ladle curds into muslin-lined colander. Let drain for 5 minutes. 10. Fill mold with curds. Flip after 10-15 minutes. Then flip every 15 minutes or so for 1 hour. Leave to drain for 24 hours. Dissolve 1/8 cup salt in 475ml boiling water. Cool before putting feta in. 1. Remove Cheese from the mold and cut into slices. 2. Place Brine solution in a plastic container with lid and keep in fridge. The flavour will increase over time but the feta can be eaten within 3 days of making. • Top with extra-virgin olive oil, herbs, chillies and serve with olives. • Drizzle with honey and cracked black peppercorns; serve with crackers. • Dress with fresh herbs and lemon juice and bake at 190C until golden on top; spread on crusty bread. We have a couple of spots left on our Cheese Making Workshop next week. Make sure you don't miss out on learning the art of making your own semi-soft and feta type handmade cheese using traditional methods. The showcase event will give people the opportunity to find fresh new talent to play at any upcoming occasions they might be organising. Bare Bones, which is a new acoustic trio based in Bridgwater, will be playing a variety of classic and modern cover tracks on the night from 7.30pm. They will play a 30 minute set before a break at 8pm. They will take to the stage again at 8.30pm to play more tracks. Entry to the event will be free and people will be able to purchase drinks and a Ploughman’s supper on the night. When the moon hits your eye, like a big pizza pie, that's amore. Following our extremely popular Italian Pop-Up Restaurant with our favourite Italian Chef, Stefano Salvati, we will be hosting a Pop-Up Italian Pizza Night on Monday 8th July. So get ready for great night of mouth-watering, authentically Neapolitan style pizzas cooked in a woodfired oven under the Somerset stars. What could be better than enjoying a traditional cream tea in the beautiful Somerset countryside on a Sunday afternoon and listening to the lively jazz sounds of The Tone Valley Jazz Band, all in the name of raising money for a fantastic charity – Macmillan Cancer Support. A percentage of ticket sales will be going towards helping this incredible charity continue their great work. So come along and bring your friends and their friends and their friends and families, and help us do something that matters! Have you ever fancied learning to play the ukulele? Well, now’s your chance! Clavelshay Barn will be hosting a fun filled Ukulele Workshop on Monday 22nd July from 7p – 9pm. This 2 hour workshop is open to all ages. Paul Clews, professional ukulele teacher from Devon, will be hosting the workshop and will supply all the ukuleles and enthusiasm. In 2 hours you could learn a couple of chords, a couple of songs, and a bit of blues. No previous music skills are needed, Paul will show you everything you need to know. Another great Italian workshop hosted by our favourite Italian chef, Stefano Salvati. This is your chance to learn the tricks of the pasta trade on this hands-on workshop. Stefano will be showing you how to make the perfect pasta dough, how to flavour and fill pasta and how to create 3 different pasta shapes – tagliatelle, gnocchi and tortellini. He will also teach you the difference between other Italian pastas such as pappardelle and ravioli, and their history and what specific regions of Italy they come from! Clavelshay Barn will be serving a delicious lunch, including some of Stefano’s homemade pasta and local seasonal ingredients from the Somerset Region. Join us for a day of fun at our Cheese Making Workshop where you will be learning the art of making your own semi-soft and feta type handmade cheese using traditional methods. This hands-on workshop is hosted by Sarah & Chris Styles-Power from The Shebbear Cheese Co in Devon. Sarah will be guiding you through the cheesemaking process, you will learn the use of cultures, rennets, draining, molding, salting and aging your cheese using everyday kitchen equipment.